Last month, USICH’s Executive Director Matthew Doherty, Regional Coordinators Katy Miller and Bob Pulster, and I joined Federal agencies and government officials, advocates, service providers, researchers, funders, and an incredible group of youth and young adults for the second annual True Colors Fund Forty to None Summit in Houston, Texas. Over the course of two days, approximately 200 participants engaged in a series of dynamic discussions on LGBTQ youth homelessness. Hearing from the youth and young adults themselves and learning from their lived experiences provided a stark reminder of why this issue is critical. Achieving the Opening Doors goal of preventing and ending youth homelessness in 2020 means we have a collective responsibility to act now. The Summit opened with a powerful dance performance from one of the True Fellows and moved into a session on intersectionality. Described by True Colors as the ways homelessness intersects with other issues and systems that youth face, this provided the framework for the entire conference. Accessing meaningful career opportunities, engaging in artistic pursuits, and making positive changes in community policing were just a few of the topics that were covered through panel discussions, interactive sessions, and presentations. 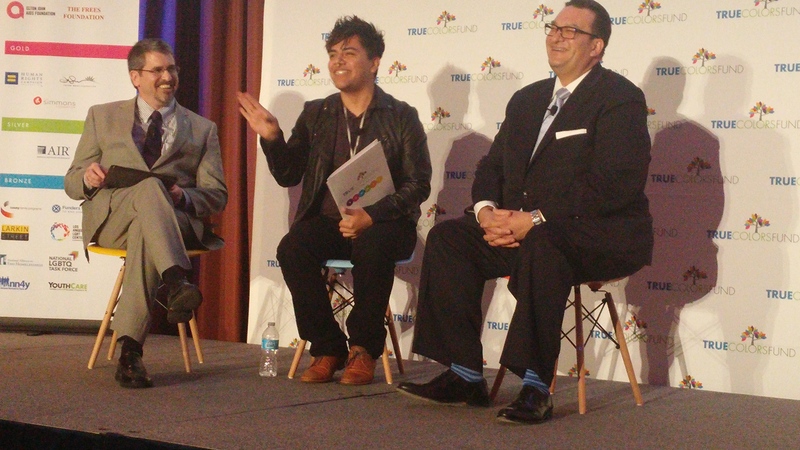 It would be hard to find anyone at the summit who was not inspired by the level of commitment to preventing and ending LGBTQ youth homelessness and the belief that this is a solvable problem. The lunch conversation with Rafael Lopez, Commissioner of the Administration on Children, Youth, and Families at the U.S. Department of Health and Human Services, along with Matthew Doherty, and True Fellow Angel VanStark, reinforced this belief and emphasized the importance of taking the lessons learned from our work to end chronic and Veteran homelessness and applying them to our work in ending youth homelessness. Using evidence to inform practice, supporting community capacity, spurring innovation and testing interventions at the local level, sustaining collaborative leadership, centering practices around people, holding ourselves accountable and tracking progress – these are critical elements of a coordinated response to ending homelessness for all populations. The preliminary vision for a coordinated and comprehensive response to ending youth homelessness is outlined in the recently released USICH guidance and was the focus of one of the presentations. This guidance builds on the Federal Framework to End Youth Homelessness and emphasizes the importance of implementing an array of services and housing options for youth that are tailored to individual needs. During the Summit, HUD highlighted the opportunities for advancing these solutions to ending youth homelessness in their recently released notice of funding availability for the FY 2015 Continuum of Care Program Competition. Participants also heard about Federal, state, and local investments to build community capacity in the area of prevention with a session on the LGBTQ Youth Homelessness Prevention Initiative, currently piloting in Cincinnati and Houston. Throughout the summit, youth highlighted opportunities for policymakers and service providers to help them and their peers achieve better outcomes in stable housing, permanent connections, education and employment, and well-being. As the experts of their own lived experiences, young people provided us with the kind of insight and understanding that is helping to inform the solutions being developed at the Federal, state, and local levels. Achieving the goal of ending youth homelessness is challenging, there is no doubt about that. There is also no doubt that our determination to end youth homelessness is greater than any challenge we may face. To borrow a phrase, a movement is building – a movement that is informed by the experiences of young people themselves and guided by our shared vision that no youth should experience homelessness and be without a safe and stable place to call home.